Being on video can be a very scary thing! 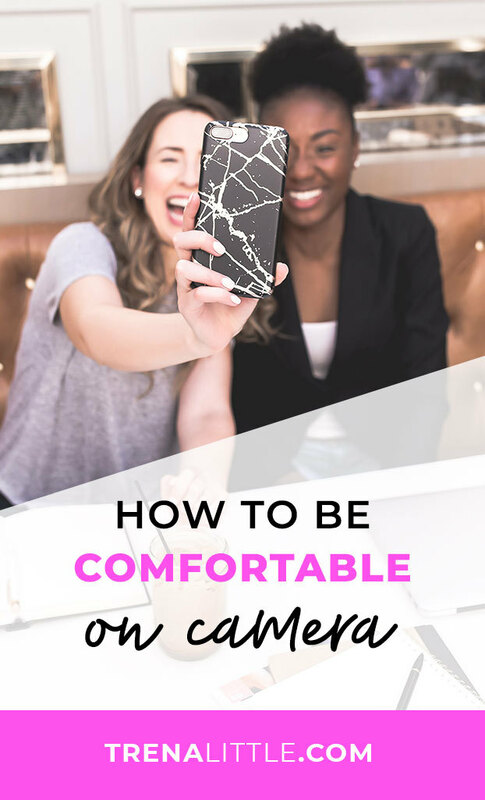 So when I tell you how important video content can be for your blog’s success, you start to break out in cold sweats and think, "I’m never going to be able to offer video content. I just hate being on camera!" I completely understand! My first couple YouTube videos are no where close to where I’m at today! In fact if you want to see, here is the link to my first official YouTube video! It might not look like it, but I had no idea what I was doing, what I was saying and I was all over the place! The video is only about 7 minutes but I will tell you, I probably cut out 20 minutes! Everyone starts somewhere. You can find even more examples of this growth by checking out popular YouTuber’s first videos! Tyler Oakley, Ingrid Nislen and Grace Helbig all leave their first videos up on their channel so you can see how far they have come! Don't forget you can share this video on Twitter, Pinterest and Facebook if you know someone who struggles with camera confidence! Camera confidence is a learned skill! This is actually why I gave you the link to people's first videos. They look like naturals now but it took them many, many videos to get there. Plus lots of practice to figure out what works and what doesn’t work for them. The fact of the matter is, some people just have less fear of being on camera than others. It’s not necessarily a talent. And fears can be over come. Just like overcoming any other fear you have to identify exactly what’s scaring you and finding the cure to over come it. Lets discuss some of the common fears of being on camera. Fear #2: I look weird. You probably have an idea in your mind of what you look like and what you sound like, based on your own perspective. So when you see yourself on camera and the perspective in you mind isn’t the same thing you are seeing on video it can be really scary! You can’t start to think, "I don't like that person!" Don’t fall down this rabbit hole! The best cure to overcome this fear is to get familiar with your “camera self”. Start practicing your videos and watching them. Yes, those first ones can be painful. Its just like the first couple runs you go on when you decided to take up jogging. Your muscles ache, your chest burns, you can't walk the next day. But just like with running, the more you do it, the more comfortable you get. I won’t say you will ever be fully happy with the person you see on camera, but you will get to the point where you are happy with what you have created! A great way to get more comfortable with your “camera self” is to incorporate more video into your daily life. A great tool to practice and build your brand trust is SnapChat! The video feature is a great way to get more comfortable with video and to practice you skill any time of the day. I did an entire blog post on why I think SnapChat is such a great tool for your business. Click here if you want to read more about SnapChat and business. Fear #3: What if others start making fun of me? Fear #4: What if no one likes me? Everyone has fear of rejection! But it’s so important to remember not everyone is going to like you. I’m sure you have probably learned this lesson in life. And now matter what you do to change their opinion they just aren’t going to like you. The best cure to over come this fear is to just accept you can’t make everyone like you. Have you ever seen “Mean Tweets” on Jimmy Kimmel? Jimmy Kimmel has celebrities read mean tweets people posted about them. I will link a video to it here. You see how they just take it with a grain of salt and know there are mean people out there. Some people have nothing better to do then to be mean and criticize what everyone else is doing. It doesn’t have to stop you in your path to greatness! I just gave you some cures to common fears about being on camera. Here are a few more tips on how to over come any other fears you have about being on camera! When creating a video, stick to your field of expertise. It will be much easier for you to talk about and you will look much more natural and comfortable talking about a familiar topic. Write a script! I preach this tip just about every where here on my blog. But a script is so important if you are just starting out. It gives you a road map on where your video is going. It also makes sure your thoughts are cohesive and you included all the key parts you want to cover! If you want more tips on creating a script you can check out this post I did just on writing a script. Practice, practice, practice. This one almost goes with out saying! The more you do something the more comfortable you are going to get with it. You could also enlist the help of your business bestie! Ask your bestie to watch your video and give you some constructive criticism to help you improve your video! Are you ready to break through your fears and start offering video content to your audience but not sure which platform you should focus on? Facebook Live, Youtube, Instagram Stories... confused? This guide walks you through the pros and cons of each to help you decide which is right for you and your business. Plus a worksheet to help you come up with video ideas AND 10 free video ideas to get started! Enter your email address below to get the guide! Lets talk in the comments below. What is your number one fear of being on camera? Lets all support each other and provide some tips on how to over come our camera fears!